They contacted emergency departments at Yale New Haven Hospital and its Saint Raphael campus and enrolled 100 patients in their study in 2013. Those selected had visited emergency rooms four to 18 times in the past year for chest pain, abdominal pain or chronic migraines, among other ailments. Milagrosa Seguinot, a CHW, entertains Madeley, 2, while Dania Lizeth Robles Navarro fills out health care forms in their Bridgeport home. The navigators at Project Access coordinated health care for the patients. They scheduled appointments with primary care physicians, provided reminders, accompanied patients to physician visits and followed up to ensure compliance with the prescribed treatment. The preliminary results were eye-opening: “We saw an average cost reduction of $153 per member per month,” said Dr. Roberta Capp, assistant professor, Department of Emergency Medicine at the University of Colorado Denver, and lead investigator of the study. Over the intervening six-month period, the use of emergency rooms dropped 22 percent among patients in the study, and the number of times they were treated and admitted to hospitals dropped 48 percent, compared with the control group of 51 patients, who received no help from navigators. Patient navigators, also called community health workers or care coordinators, are employed by nonprofits, hospitals, clinics and federally qualified health centers. Their goal is to improve access to care and health outcomes and reduce cost. Yet, in part because of funding, they are sorely underutilized. Connecticut is like most states that pay community health workers through grants. Private insurance and Medicaid will not cover the cost of their work in Connecticut. But in some states, such as Minnesota and Pennsylvania, Medicaid covers community health workers’ pay. “As a funder, we found that as soon as our grant funding ended, so did the employment of the community health worker,” said Patricia Baker, CEO of Connecticut Health Foundation Inc.
Consequently, the foundation asked the University of Massachusetts Medical School’s Center for Health Law and Economics to design four models based on successful programs nationally that use community health workers and would achieve a positive return on investment if implemented in Connecticut. • Preventing cardiovascular disease complications in 148 adults in Windham County, savings of $388,000. The current fee-for-service model, where payment is made to providers for each service offered – whether a test or a doctor visit – is another barrier to hiring and retaining community health workers, said Cobbs-Lomax. Thirty-four states, including Connecticut, are working with the Centers for Medicare & Medicaid Services to lower health care costs and improve outcomes. At present, the State Innovation Model (SIM) is working on payment reform, but “there’s not really a way to fit CWHs in,” said Cobbs-Lomax. This year, the legislature approved a bill to study the feasibility of creating a certification program for community health workers. The bill, signed by the governor, took effect Oct. 1. “We are hopeful for a day where health providers, hospital systems and payers align their work in ways that incorporate CHWs into the health care team to lead to better outcomes,” said Tekisha Dwan Everette, executive director, Health Equity Solutions Inc., Hartford. 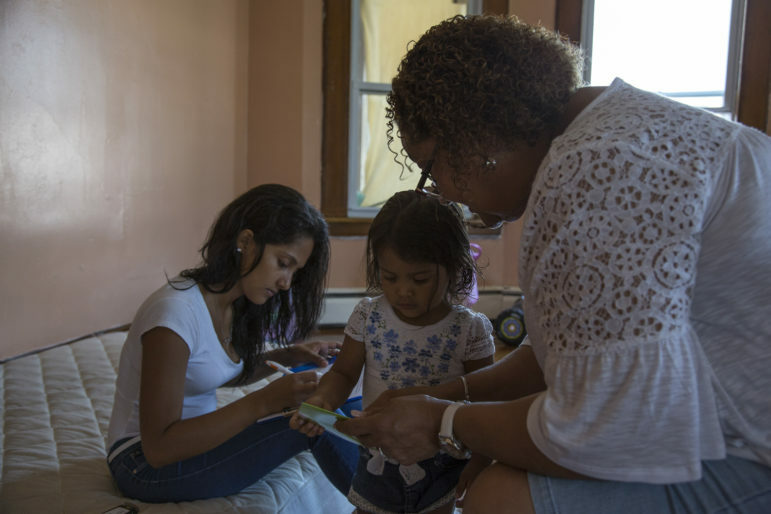 Jova Perez, a mother of two from New Haven, has a consultation with navigator Juan Carmona, who is guiding her through her breast cancer treatment and follow-up care. A community health worker helped Jova Perez, a mother of two from New Haven, who was diagnosed with breast cancer at a community health clinic last year. Perez, who is uninsured and does not speak English, was referred to Project Access, where navigator Juan Carmona put her under the care of volunteer oncologists, surgeons and radiologists. Interventions can lower health care costs, especially for people on Medicaid, experts say. In 2016, the state spent $245 million on ED visits alone, up from $227.8 million in 2014 – a 7.6 percent increase, according to the state Department of Social Services. ED costs per Medicaid member per month rose 2.97 percent during the period, driven by an 8 percent increase in cost per ED visit. Part of that is also a steady increase in enrollment, to 780,399 as of July 1, 2017, for Husky Health. Providers note that it’s not enough to treat patients medically unless other problems are fixed. At the Southwestern Area Health Education Center Inc., in Shelton, CHWs make home visits to get Bridgeport children, age 0-2 vaccinated. As a result, Milagrosa Seguinot, CHW project coordinator, said, vaccination rates rose to 83 percent in 2015, organization’s 2015 data show, up from 63 percent in 2005. Also, only 53 percent of children had a checkup with a primary care doctor in 2005. That number climbed to 94 percent in 2015. “We have knowledge of how the community lives, and we know how to connect with them,” said Seguinot.